From front to back, Montmorency cherries, bing cherries and Columbia River tart cherries. All photography by Melody Lan. KAREN HOCHMAN is the Editorial Director of THE NIBBLE™. CAPSULE REPORT: Chukar Cherries is located in the heart of America’s cherry-growing region, in Prosser, Washington. Their line is extensive; other products are reviewed in the corresponding sections of THE NIBBLE. Here in the Fruit Section, we review three distinctively different types of dried cherry that show, with a nod to Gertrude Stein, that a cherry is not a cherry. And...surprise...though we thought we’d prefer the sweet cherries (Bing and Rainier) to the tart one, the tart (Montmorency) cherries won our heart. Americans love cherries, deep and succulent. In season they’re a treat, and when they’re not, there’s still cherry vanilla ice cream, cherry pie from canned cherries, cherry preserves, black cherry soda, cherries galore. About 15 years ago, dried cherries entered the marketplace, looking like redder raisins and providing a closer affinity to cherry sweetness all year around. When the French settlers from Normandy emigrated to the Midwest, they planted cherry pits along the Saint Lawrence River and in the vicinity of the Great Lakes. A Presbyterian missionary from Michigan, Peter Dougherty, is credited with beginning modern-day cherry production. In 1852 he planted cherry trees near Traverse City, Michigan. But while sour cherries were becoming an industry in Michigan in the 1850s, sweet cherry orchards were thriving in the Willamette Valley near Salem, Oregon, thanks to a man named Henderson Luelling and his brother Seth (who spelled his last name “Lewelling”). Henderson had planted his orchard in 1847. Seth joined his brother at his orchard and took over it in 1854. He developed a sweet and succulent cherry and he named the variety Bing, after a Manchurian workman who he employed during the 1870s and 1880s. Cherries belong to the Rosaceae, subfamily Prunoideae, genus Prunus, along with the other stone fruit—plums, apricots, peaches and almonds. Cherries are in the subgenus Cerasus. There are two types of cherry cultivars, sweet (Prunus avium L.) and sour (Prunus cerasus L.), and within these two groups are numerous varieties. Sweet Cherries include varieties such as the Bing, Lambert, Napoleon (also called the Royal Ann) and Rainier. Sour Cherries include the Montmorency, which accounts for 95% of all production. Early Richmond and English Morello are two other tart cultivars of importance. All varieties of cherry have very short growing seasons. Bing cherries are generally available from the end of May to early August, with peak season in June and July. Rainier are available until about mid-August. The growing season of sour cherries such as Morello and Montmorency is very short—both begin and end in July. The cherry varieties that appear earlier and later in the season than Bings are softer and less sweet. Any fresh cherries found in the market after August are most likely from cold storage, although there are some imports from New Zealand during the winters. 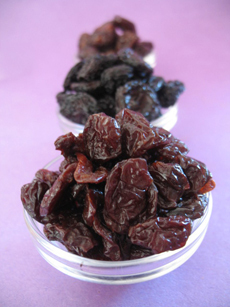 That’s why dried cherries offer an opportunity to enjoy this fruit favorite all year long. Chukar sells 100% natural, dried Bing, Columbia River Tart Cherry (a variety of Montmorency) and the Rainier. All	three	are naturally juicy and sweet with no preservatives. The Bing and Rainier have no sugar added; the Columbia River Tart Cherry has a little sweetener. They deliver extra flavor and aroma since they are dried naturally with no additives. Each would be perfect for adding to your favorite recipes or for snacking. But	each	tastes	very different from its cousins, so what you buy will depend on what your palate prefers. Bing Cherry. The Bing is the leading commercial sweet cherry in North America. The fruit is firm, juicy and a deep, mahogany red when ripe. It has an intensely sweet, vibrant flavor. 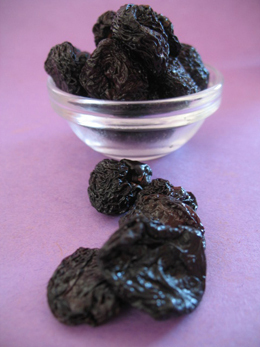 Dried, the dark, purple-red flesh and dark ruby skin turns nearly black. It is the largest and darkest in color of Chukar’s cherries, looking like tiny dried plums. The flavor is a bit plummy too. Columbia River Tart Cherry (Montmorency). Naturally sour, lightly sweetened with cane sugar—but still with a tart, tasty flavor. The cherries are very bright red in color and much smaller than the sweet varieties—the size of large raisins. The flavor is ripe and red too. They have much more pizzazz than the Bings: if Bing is the stodgy banker, the tarts are the dancing flappers. Bing, the most stately in flavor—and looks. Rainier Cherry. When fresh, the Rainier is an exceptionally large, yellow cherry with a bright red blush. The cultivar was developed at the Washington State University Research Station by Dr. Harold Fogle, and named after Washington’s highest mountain. Sweet, firm-fleshed and delicately flavored, it dries into succulent morsels, tasting the most like cherry preserves without the added sugariness. How Do You Like Your Cherries? Columbia River Tart Cherries. These are Montmorency Cherries, one of the largest variety of sour cherries grown in the U.S. With its sweet-tart, rich “red” flavor, it’s our favorite of the three. Food historians can’t pinpoint the exact origin of the cherry, but believe it came from somewhere between the Black and Caspian seas of Asia Minor (the vicinity of Persia, today’s Iran). 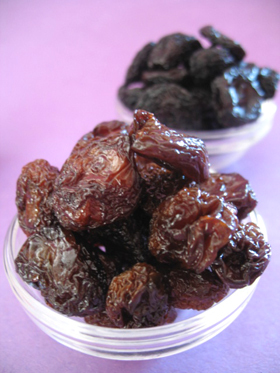 In Persian cuisine, sour cherries, both fresh and dried, are often served with meats. Here’s a recipe for Persian sour cherry rice. Cold sour cherry soup, made with sour cream and spices, is a popular Hungarian dish in the summer for the brief time sour cherries appear. Every family has its own recipe—some include wine or apple juice. Find some recipes and experiment. Soak some cherries in Kirsch, a liqueur made from crushed cherry pits and the distilled juice of black cherries. Use them to top fruit sorbets, or to perk up fruit salads. You can also add them to tea, to update the Russian tradition of a spoonful of cherry preserves to sweeten a glass of plain tea (no milk!). Berry & Almond Mix. Dried bing cherries, dried cranberries sweetened with cane sugar and roasted almonds. Berry & Pecan Mix. 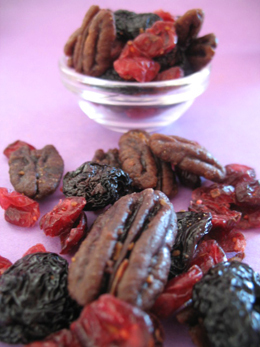 Dried bing cherries, dried cranberries sweetened with cane sugar and honey-roasted pecans. Berry & Pistachio Mix. Dried bing cherries, dried cranberries sweetened with cane sugar and roasted pistachios. 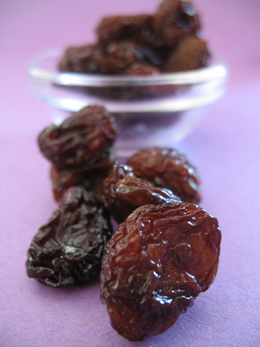 Dried cherries are a treat that could make you forget all those raisins and Craisins®. Round nuggets of Rainier Cherries, with Bing Cherries in the rear.